It's Friday and that means that you — and all of your gifs that have been waiting so patiently throughout the week — are invited to a gif party. Why? Because you guys are awesome. 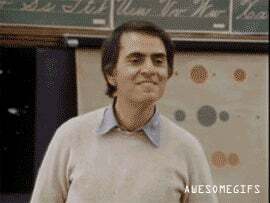 H/T to commenter dpeif for this week's Carl Sagan gif, submitted via last week's inaugural Friday Gif Party.